American rifle and cartridge designer Charles Newton has been described as the “Father of the high velocity rifle” and this is partially true. However it should be remembered that there were others such as the renowned British rifle maker Holland and Holland who created the original belted magnum, the 375 Holland and Holland Magnum, back in 1912, around the same time Charles Newton was creating his rifles and cartridges. Holland and Holland did not stop with the venerable 375H&H and went on to create the 300 H&H Magnum and the barrel burning 244 H&H Magnum. Charles Newton created a number of proprietary cartridges under his own name including the .256 Newton, 30 Newton, 33 Newton, 35 Newton and the .40 Newton. He also created his own bolt action that has some similarities to the Mauser 98 bolt action but which is sufficiently different to be considered a different design. 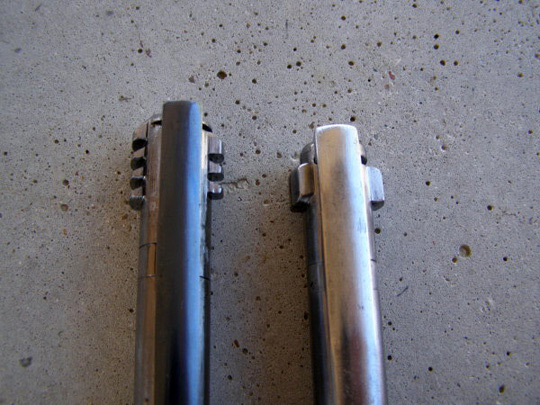 The multi lug bolt of the Newton rifle (left) by comparison with the Mauser 98 (right). (Picture courtesy theboxotruth.com). Newton’s bolt action design features multiple front locking lugs creating a very strong action yet it also retains the Mauser 98 style claw extractor and controlled feed. It’s sort of like a cross between the Mauser 98 and Roy Weatherby’s action, but it precedes the Weatherby. An illustration from the book “The Newton Rifle Handbook” by Lawrence S. Wells showing the multi lug bolt and claw extractor providing a controlled feed action. (Picture courtesy newtonrifles.com). You will find the book “The Newton Rifle Handbook” on Amazon if you click here. Below is a diagram of the Newton Action. You will find John Walter’s book “Rifles of the World” on Amazon if you click here. 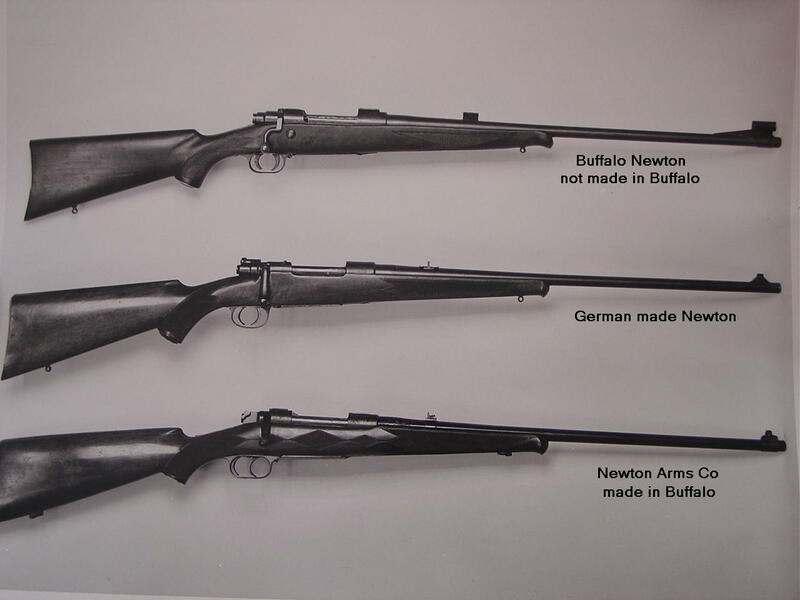 Newton rifles were built on a number of actions, not just on the actions of his own design. The top rifle is a Newton design and made at his Buffalo works. The centre rifle is a Newton design but not made at the Buffalo works. The bottom rifle is a Newton rifle made on a commercial Mauser 98 action. (Picture courtesy iroquoisarmscollectors.org). There were even rifles made under the Newton name built on American James Paris Lee’s bolt action which became famous as the action of the British Commonwealth standard service rifle through two world wars, the Lee Enfield. 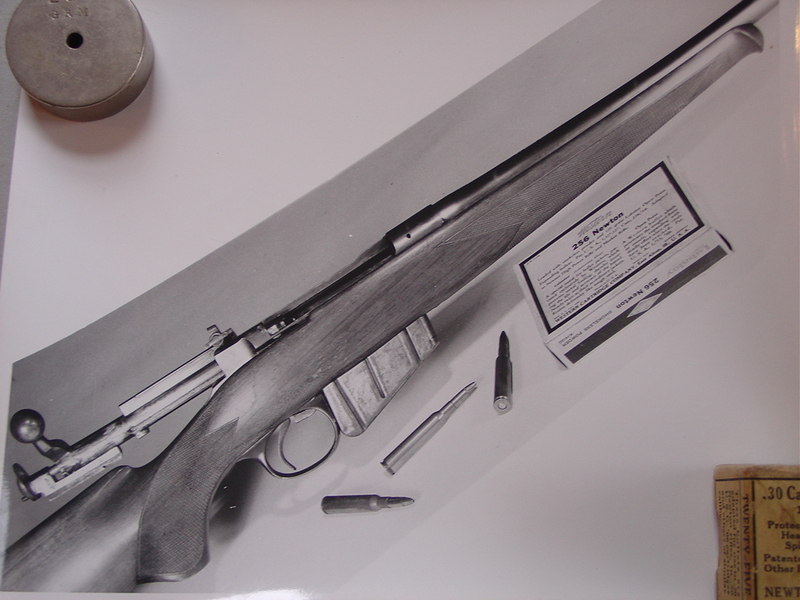 A Newton rifle in .256 Newton built on a Lee action. This would be one fast reloading high capacity gem of a rifle. (Picture courtesy iroquoisarmscollectors.org). For collectors the rifles made at Newton’s Buffalo works are the most sought after. These are the model 1916 in particular which are the pure Newton design. 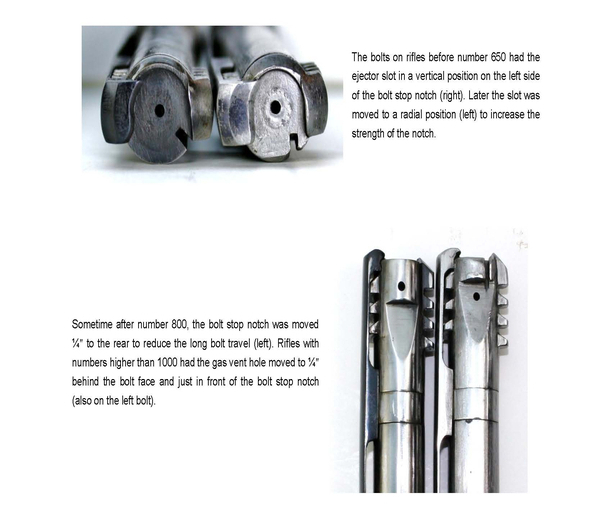 These rifles can be found with the original finer “interrupted thread” locking lugs of the earlier models or the fewer lug later models (illustrated in photographs above). Newton Model 1916 rifle. (Picture courtesy milpas.cc). What appears to be one of these rifles is coming up for auction by Rock Island Auction on August 5th 2016. The Newton rifle in .256 Newton coming up for sale by Rock Island Auction. (Picture courtesy Rock Island Auction). You will find the sale page for the Newton rifle pictured above if you click here. The sale rifle appears to be fitted with a nice peep sight, possibly a Lyman No. 48 installed with target adjustment knobs. 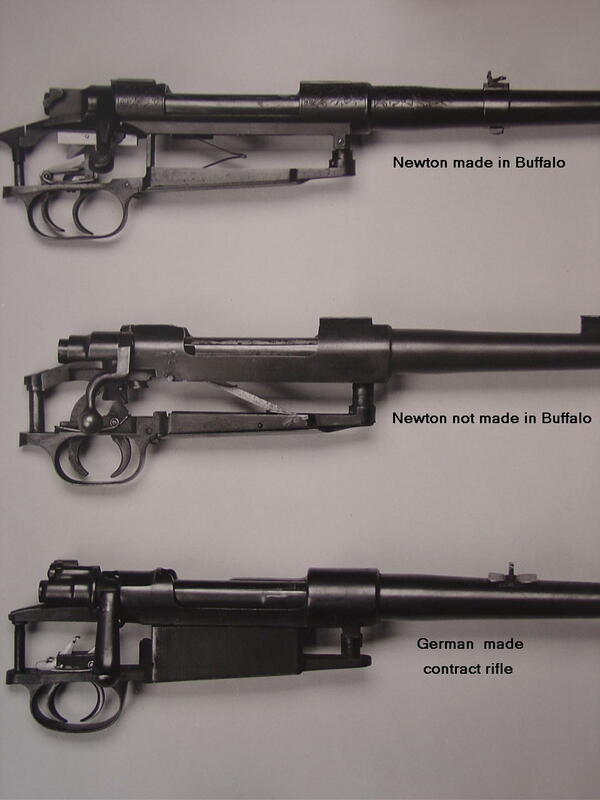 Although there were something of the order of four or five thousand Newton rifles made likely less than three thousand were made at Newton’s Buffalo works. Others were built after Newton Rifle Company went into receivership when they became yet another victim of the Wall Street crash and the Depression that followed it. So these rifles are quite scarce. But those who have them usually tend to really appreciate them and value them. Certainly if you have an old Newton rifle taking up space in your gun cabinet please feel free to donate it to us at Revivaler as we will happily give it an appreciative new home. Original advertisement for Newton rifles. (Picture courtesy iroquoisarmscollectors.org). For more detail on Newton rifles there are some good articles freely available on-line. For the article “The Newton High Power Rifle” by Townsend Whelen (Taken from The American Rifleman) click here. 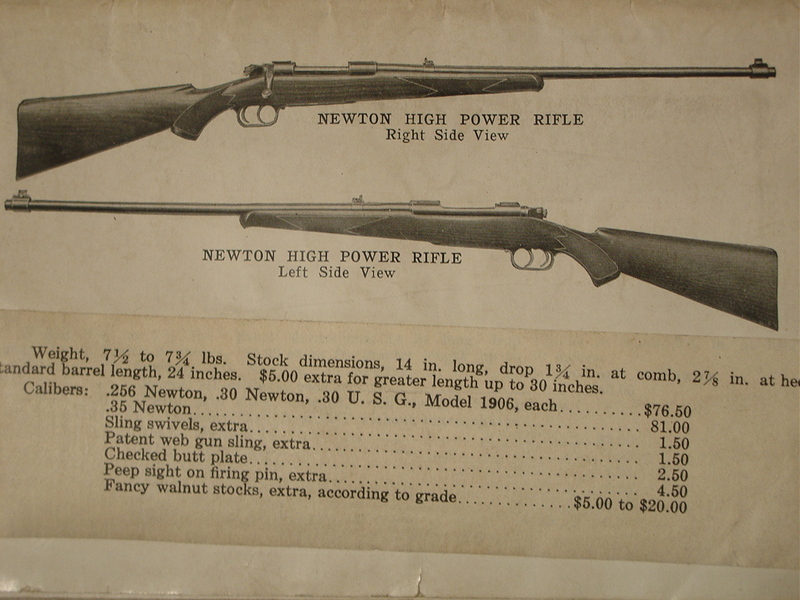 For a summary of Newton rifle models on The Newton Rifle web site click here. And for a nice hands on article about a young man named Vern who swapped a motorcycle for a very nice Newton rifle in 30/06 click here. That article includes instructions and pictures on how to field strip and take down your Newton. Charles Newton’s rifles are a classic piece of the history of American rifles. They are amongst the most interesting rifles ever created in the United States.